In the last decade, the number of diagnoses of major psychiatric conditions in kids, like ADHD, depression, and bipolar disorder, have skyrocketed. Can it really be that so many of our children are born with faulty brain chemistry? Or are we simply too willing to assign a diagnosis and medicate them? Dr. Shannon equips parents and caregivers with a better way to understand the mental health challenges their children face, including how cutting-edge scientific concepts like epigenetics and neuroplasticity mean new hope for overcoming them. Readers learn how the most common stressors in kids—inadequate nutrition, unaddressed trauma, learning problems, family relationships, and more—are often at the root of behavioral and emotional issues, and what steps can be taken to restore health and wholeness, without immediately turning medication. SCOTT SHANNON, MD, ABIHM, is assistant clinical professor of psychiatry at the University of Colorado and past president of the American Board of Integrative Holistic Medicine. Board certified in Child/Adolescent Psychiatry and Integrative Holistic Medicine, he teaches health care professionals around the world how to approach children’s health and well-being holistically, without assuming pathology. He is the founder of the Wholeness Center in Fort Collins, Colorado, the largest and most comprehensive integrative mental health clinic in the U.S. (www.wholeness.com). 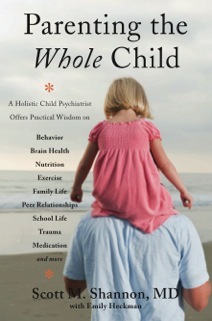 Dr. Shannon is also the author of Mental Health for the Whole Child.